Feel free to listen to high-quality samples of ragtime, boogie, stride, and ballads courtesy of Ross MacLachlan. I've been playing piano since I was a very young. 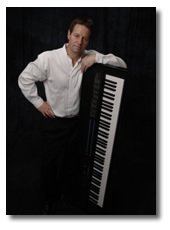 I've played professionally for 25 years and continue to promote the styles listed on this page. My prime interest is early jazz. Below are acoustic samples of classic ragtime, boogie-woogie, stride piano and ballads. We had a lot of fun recording these tunes. I hope you will hear that in the performances. I've renamed this rag in support of the vitality President Obama will bring to all of us. You can download it for free! A pure novelty rag written by Tom Turpin in 1901. Turpin wrote many catchy rags. Bob Arlidge adds bass and Gary Barratt adds drums to give this rag an excellent grove. My favourite rag to play! My first ragtime composition was inspired by Scott Joplin. The bluesy intro and walking bass in the middle strain set this apart from traditional ragtime. My first novelty piano rag. The Jalopy starts its engine and then putts along with a few honks along the way. Gary Barrat adds the Jalopy horns while he's drumming. Hope you like it! A very Chopinesque rag written by Joseph Lamb in 1915. This is Classic ragtime at it's finest. A simple but beautiful piece of Classic piano ragtime written by Charles Hunter in 1901. This style is actually called "folk" ragtime. It's still one of my favourite rags of all time. Classic Albert Ammons. What�s not to like about the rolling boogie-woogie piano bass that was Ammons' trademark? My boogie has that 50s influenced sound that the old rock�n�rollers borrowed from the boogie-woogie masters. Tim Roberts doubles up the sax to add to the groove. It's called Kidd's boogie because I've called myself the Ragtime Kidd for several years. Otis Spann wrote this boogie in 1964. The addition of bass and drums and my own styling give this catchy tune a different flavour than the original. I�ve always loved Errol Garner�s version of this Joe Sullivan stride piano composition. I added the extra instrumentation and changed the feel slightly. I really enjoy playing this song! Pete Johnson's stride piano style is what I consider the forerunner of rock�n�roll. December is a quiet ballad with piano, cello and bass. This melody came to me in my living room during a gentle December snowfall with large flakes floating down around the house. It was haunting at the time. Jess Lindeman's cello fills the room full of sound. A day in the life of a little bird. Starts off with a sleepy ballad, has a busy day chirping with all of his buddies and then calls it a night. Spencer Evans on clarinet does a great job conveying the mood of the little bird. Written by Walter Donaldson and Gus Kahn in 1925 has enjoyed success in the 1920s, 30s, 50s and 60s by artists such as Eddie Cantor and Frank Sinatra. The great American song has become a standard that has been recorded by over 100 artists in genres from jazz to rock, marimba and country. I hope you enjoy this 1920s ragtime/jazz version. Written in 1850 by Stephen Foster, known as the "father of American music". Gary Barratt and I have tried to capture the excitement of the Camptown Races with a real upbeat version of this American classic including the sound of the horses running. If you like what you hear, you can purchase my album digitally (high quality MP3s) or I can mail you the CD within 2 business days, your choice. Songs recorded in my early days under the name "Doctor Drums and the Ragtime Kidd" are available here.